If Euro is Weak… and the Dollar is Weak….. Where should I go? 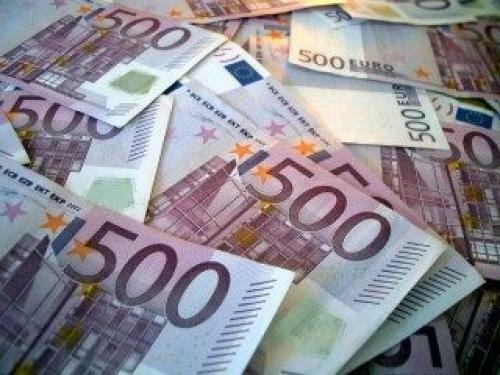 As the Euro continues to trade higher against the Greenback, many traders are left scratching their heads as to why we are seeing these gains. Some traders would point to the recently passed Greek Austerity plan. Traders on the other side, looking for Euro weakness, might bring to mind the rising Spanish and Irish bond spreads. The bond spreads of these two nations is of extreme importance now, as these yields can help show us how much risk the market perceives to be involved in each of these economies. Quite simply, the higher the rate – the ‘riskier,’ the market is considering these economies to be; and the higher the propensity of a potential default. However – the recent ‘strong vigilance,’ comment from ECB Head Jean-Claude Trichet regarding inflation leads many traders to believe that the Euro Zone will enact a rate hike at their next meeting, scheduled for next Thursday (July 7th). This could very well explain the strength seen in Euro this week, with potential strength leading up to the announcement. However, the potential issues in Europe are very real. And in the United States matters don’t necessarily look much better as both sides of the political arena spar over the US Debt Ceiling – the whole time the head of the Treasury (Timothy Geithner) is reported to be considering stepping down from his post. Needless to say – If I’m looking to short the Euro, I may want to look at another currency that could potentially be stronger than US Dollars. One currency that has been quite strong that may potentially fit the bill is the Japanese Yen. Yen has shown considerable strength after the coordinated G-7 intervention (on the heels of the Tsunami, and Fukushima). 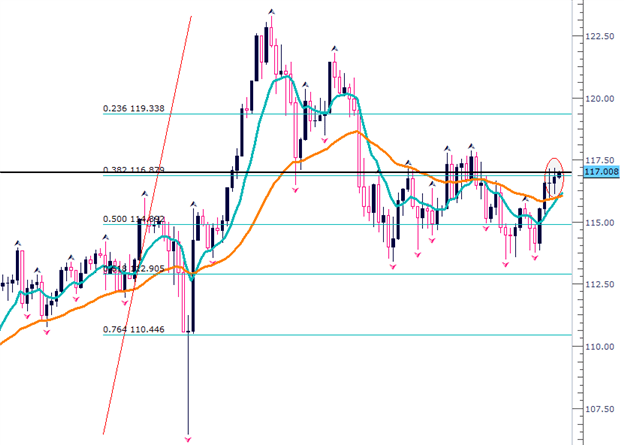 EUR/JPY has faced considerable resistance at the 117 level over the past 3 days. Notice the wick of the past 2 daily candles intersecting with this key level. Current bullishness has pushed price right up to this 117 level – and if EUR/JPY fails to break through – I’m going to look for a potential short position. I’d like to enter a short position if momentum is strong enough to breach 116.50 – with my risk shortly above the top of the wicks of this grouping of candles. I’m looking for slightly more than 2 times my initial risk level (160 pips). 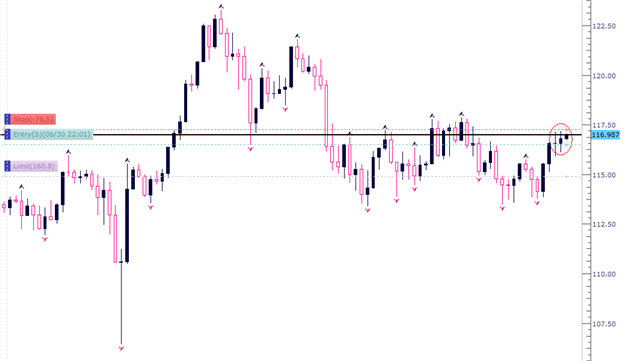 Below, you can see the entire trade outlined on the FXCM Trading Station Application – utilizing the Trading from Charts feature in which traders can place, and manage their trades without ever leaving the Charting package. The Dow Jones-FXCM U.S. Dollar index (Ticker: USDollar) tumbled lower during the overnight trade, but the rebound from 9546.92 should gather pace going into the end of the week as risk appetite appears to be tapering off. The USD remains 0.16% lower from the open after moving 64% of its average true range, and the correction should gather pace over the next 24-hours of trading as the relative strength index bounces back from a low of 17. 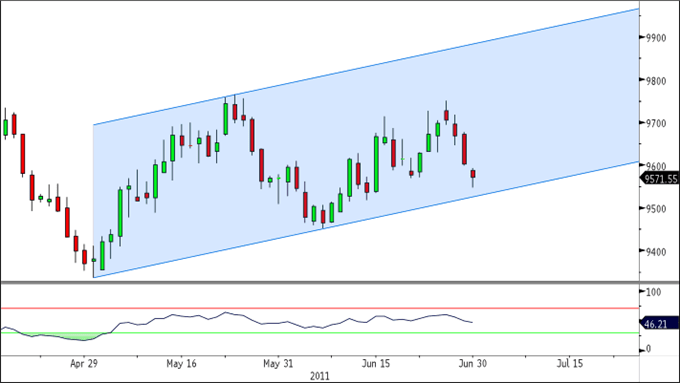 However, as the gauge breaks out of the upward trending channel from earlier this month, the greenback may consolidate heading into July, but the shift away from risk-taking behavior may gather pace over the near-term as the Fed prepares to withdraw the additional $600B in quantitative easing. 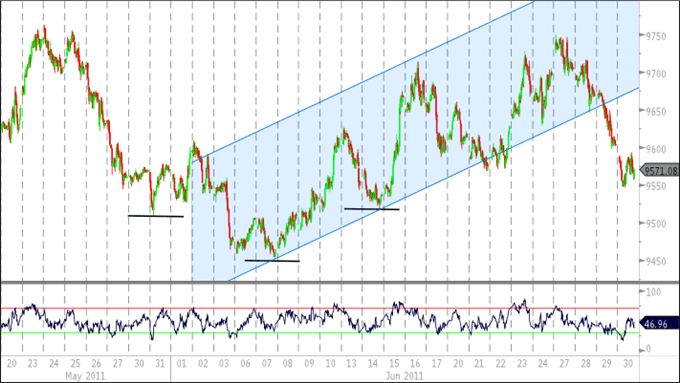 Indeed, the daily chart reinforces a bullish outlook for the USD as price action trades within an upward trending channel from the 2011 low (9337.19), and we should see higher prices in July as we expect the index to fill-in the gap from the previous day. As the rebound picks up, we should see the index make another run at 9800.00, and the greenback may continue to trend higher in the second-half of the year as the Fed draws up a conditional exit strategy to withdraw monetary stimulus. All four components gained ground against the greenback for the second consecutive day, led by a 0.57% rally in the Euro, and the single-currency may continue to trend higher over the near-term as the European Central Bank is widely expected to raise the benchmark interest rate by another 25bp at the next policy meeting on July 7. However, as Euro-Zone faces a slowing recovery, ECB President Jean-Claude Trichet may soften his hawkish tone for inflation, and the central bank head may endorse a wait-and-see approach for the second-half of the year as the fundamental outlook remains clouded with high uncertainty. In turn, the relief rally in the EUR/USD may taper off in the days ahead, and the exchange rate may work its way back towards 1.4000 as it continues to trade within a descending triangle.